Although Viet Nam is the world’s third largest exporter of natural rubber, businesses still have to import rubber raw material to meet the demand for production and processing. Tyre produced at the Southern Rubber Industry Joint Stock Company in Dong Nai Province. 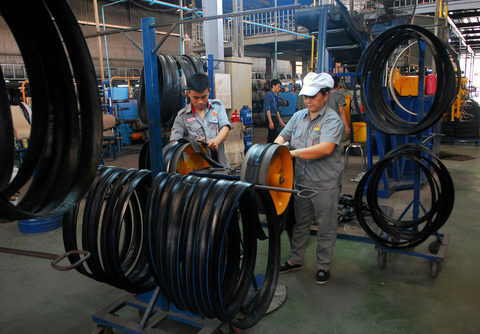 According to the Viet Nam Rubber Association (VRA), most of the materials are imported for re-export and only partly meet the needs of local tyre manufacturers. Most of the imported rubber materials are TSR 10 and TSR 20, which are in huge demand by tyre companies but are only produced locally in small quantities due to low prices. Nguyen Dinh Dong, deputy general director of the Southern Rubber Industry Joint Stock Company (Casumina), says 75 per cent of Casumina’s input is domestic natural raw materials. It has to import the rest from Malaysia or Thailand to produce high-grade steel belted tyres. On the other hand, most rubber raw material factories in Viet Nam have low capacity and do not meet the requirements of quality uniformity. Da Nang Rubber Joint Stock Company (DRC) also needs about 18,000 tons of natural rubber annually, mainly SVR10 and 20, but often is unable to find sufficient domestic supply. This frustrates domestic tire manufacturers who then prefer imports that they can obtain quickly, Khang said. According to Tran Thi Thuy Hoa, head of the VRA rubber development consultancy, SVR 10 and SVR 20 only account for about 15-17 per cent of local demand, while the actual demand is up to 65-70 per cent. Domestic raw material producers only focus on producing high-end premiums, such as SVR3L, SVR-CV 50, SVR-CV 60, with little attention paid to the SVR10 and 20 production line. VRA statistics show that from 2016 to date, the price of SVR10 has been US$40-220 per tonne lower than the price of SVR3L. Therefore, investment in SVR3L production yields higher profits. However, market demand is tilted towards SVR10 and SVR20. In the tyre industry, SVR 3L is mainly used to produce tubes, but the market is now favouring tubeless tires, thus sales of SVR 3L are difficult. Global forecasts also put the demand for natural rubber at 15 million tonnes, only 150,000 tonnes of which are SVR 3L. If businesses do not reduce SVR 3L output and keep investing in expanding production, they will face the risk of an excess supply of 300,000 tonnes. Realising the trend, some enterprises have started to invest in new SVR 10, SVR 20 rubber production lines instead of SVR 3L. Tran Thanh Phung, deputy general director of the Phu Rieng Rubber Company, says the company has invested in a SVR 10 production line and is supplying raw materials for big tire companies such as Goodyear and Kumho. However, the SVR10 output accounts for only 20-25 per cent of the firm’s total output. Adding lines to increase SVR10 and SVR20 output to meet market needs will be weighed against prospects of ensuring profit in the future, Phung said. Experts say investment in new production lines for SVR10 and SVR20 rubber requires enterprises to adopt new business strategies to reach the market.